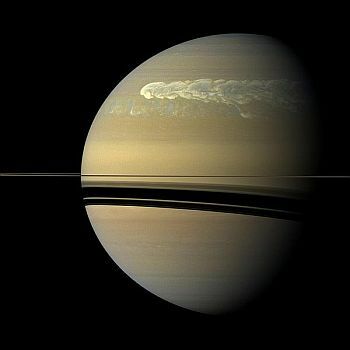 The planet Saturn is the sixth one from the Sun and, with an average diameter of 35,500 miles, is the second largest planet in the solar system, after the mighty Jupiter. The planets of the inner solar system are grouped quite tightly around the Sun. When we get into the outer solar system, however, the gas giants are spaced extremely widely. The planet Saturn orbits the Sun at an average distance of just over 890 million miles - that's around 400 million miles further out than Jupiter! One orbit of the Sun takes 29.5 years. Saturn has an extremely low density. It weighs in at around 580,000 million million million tons, but, due to its size, it is said that it would float on water! 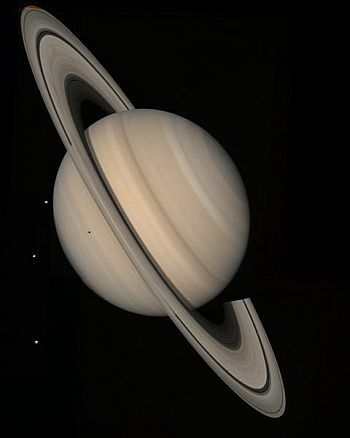 Saturn is one of the "gas giants", which sort of implies that it's made entirely of gas, with a small solid core. This, apparently is not the case. At its centre, there is a solid rocky core of around 15,500 miles diameter. Above this is an area of metallic hydrogen. The nearer the surface you get, this becomes liquid hydrogen, then, finally, gaseous. This outermost gas layer is around 620 miles thick. Some sort of heat generating mechanism is taking place in Saturn's interior, resulting in the planet radiating over twice as much heat as it receives from the Sun. The temperature at the core can reach levels in excess of 10,000 degrees Celsius. 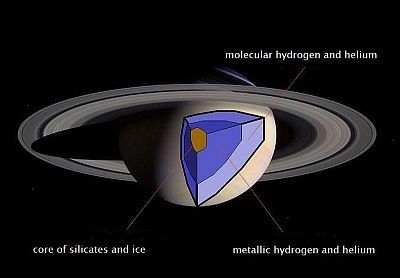 Covering Saturn's atmosphere is a layer of cloud, consisting of differing combinations of ammonia ice, water ice and ammonium hydrosulphide. The result is that Saturn's appearance is striped, in much the same way as Jupiter, but with much less contrast between the different colours. The planet Saturn has weather systems, such as its own Great White Spot, a storm similar to the red one found on Jupiter. 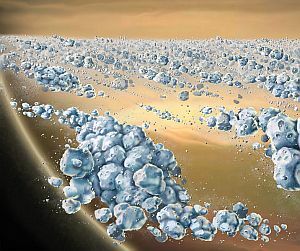 There's also a unique feature at the planet's north pole, a fixed storm forming a perfect hexagon. More on this can be found here. Saturn has the second strongest winds in the solar system, after Neptune. Wind speeds have been recorded in excess of 1,100 miles per hour. The origin of the "main rings" (A, B and C) is a matter of speculation. Either they are the remains of a moon that was shattered by Saturn's tidal forces or they are material left over from the original stuff from which Saturn was formed. Like most things in astronomy, Saturn's rings have been categorised. There are 10 rings in all, each containing divisions and gaps (all with names). 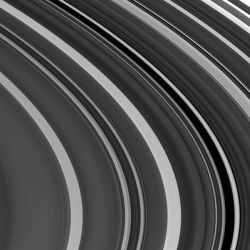 The ring system also features "ringlets" and ring arcs. This is the innermost of Saturn's rings, its nearer edge being 41,569 miles above the planet's equator. It is 4,660 miles wide. It is very faint. You can see, in the image right, the contrast between it and the C ring, just visible upper left. The D ring contains three ringlets, named D73, D72 and D68. Also visible in the image is the corrugated pattern of waves, which suggest the ring may have formed from a comet impact in 1983. This is the next ring out, starting at 46,390 miles from Saturn's surface. It is quite wide, at 10,874 miles. 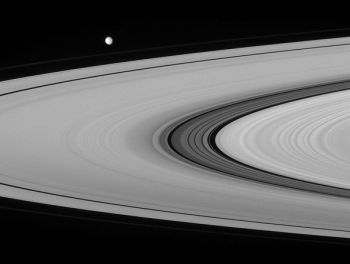 Although part of the main ring system, it is composed of significantly darker material than rings A and B. With a thickness of less than 17 feet, it would be almost transparent if viewed from above. This image shows C Ring's highly contrasted bands of colour, which are caused by the different densities of the ice particles. The C Ring also features the Colombo Gap, which contains the Colombo Ringlet. Further out within the ring is the Maxwell Gap (visible right as the dark band running top left to bottom right), within which is the Maxwell Ringlet. This could be considered the main ring out of the main rings! It's the brightest and widest. Starting out 57,166 miles from Saturn, it extends for 15,845 miles into space. Its thickness can reach an impressive 50 feet. 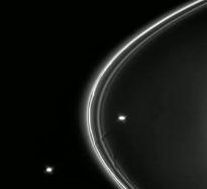 Saturn's B Ring also appears to have a moonlet embedded in it. Only discovered in 2009 and, as yet, unnamed, it is estimated to be around 1,300 feet in diameter. This is a 2,920 mile wide area separating the B and A rings. It can be seen quite clearly in the above photo and, to all intents and purposes, looks empty. 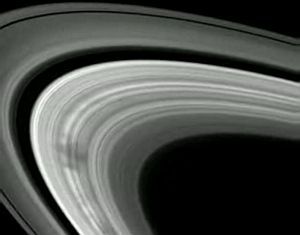 However, checking out this image, taken by the Cassini probe, you'll see that it actually consists of dark grey bands. It is thought that the Cassini Division contains material similar to the C Ring. On its inner edge can be seen the Huygens Gap, which contains the Huygens Ringlet and, further to the left, the Laplace Gap. The white dot in the picture is the moon, Mimas. Beginning at the outer edge of the Cassini Division, 13,776 miles out from the planet, this is the outermost of the main rings. It is 9072 miles wide and can be up to 100 feet thick. About three quarters of the way out, within the ring is the Encke Gap. This is around 200 miles wide and, as can be seen in this image, contains a ringlet. 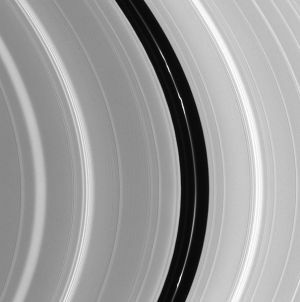 In fact, the Cassini probe has shown that there are at least three of these ringlets within the gap. Further out towards the edge of A Ring is another, smaller gap. The Keeler Gap is 26 miles wide. This is a 1,615 mile wide area between A and F Rings. Like the Cassini Division, it is not empty, but contains sparse dust-sized particles, similar to rings D, E and G.
This is a very thin ring located some 87,103 miles out from the planet Saturn. Its width can vary between 18 and 310 miles. The Cassini probe has revealed that it consists of a central ribbon with other material corkscrewing round it. It is kept in place by the two "shepherd moons", Prometheus and Pandora, which orbit either side of it. There's more to Saturn's ring system. 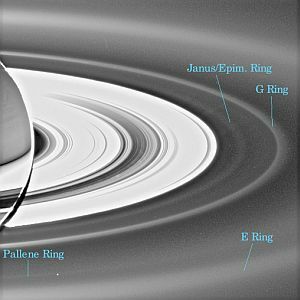 Further out, very faint rings have been discovered and have been collectively designated "outer rings". The Janus/Epimetheus Ring is 92,600 miles above the surface of Saturn. With a width of 3,100 miles, it is composed of dust and is very faint. Another 7,456 miles further out is the G Ring. At 5,592 miles wide, it is made of faint dust particles, except for one bright arc consisting of yard-wide chunks of ice. Next, at 111,846 miles out, we have the impressive E Ring. Although very tenuous and faint, it is no less than 186,411 miles wide. Within this ring there are two ring arcs. 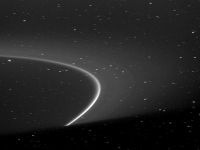 At 120,688 miles out from the planet is the Methone Ring Arc, associated with the moon of the same name, then the Anthe Ring Arc, also connected to its namesake moon, at 122,823 miles. Also, there's a ring within a ring! The E Ring houses the Pallene Ring. It is 1553 miles wide and connected to the moon, Pallene. Finally, at 2.5 million miles out from Saturn, there is the outermost Phoebe Ring, a practically invisible collection of dust particles that was only discovered in 2009, using infra red imaging. It is thought that its width could be as much as 5.5 million miles! The planet Saturn has no less than 62 confirmed moons. Most of them, however, are extremely small, with diameters of less than 30 miles. It is difficult sometimes to tell when an object that might be a small moonlet has dimensions small enough to be considered a large ring particle. The distinction is somewhat blurred. Anyway, the planet Saturn has a small selection of large inner and outer moons. These - Mimas, Enceladus, Tethys, Dione, Rhea, Titan and Iapetus - all have their own pages on this site. This page will therefore detail all the others. 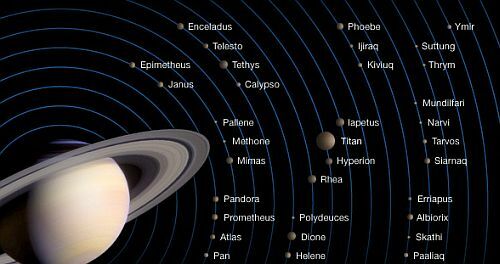 The inner rings of the planet Saturn feature several types of moon, some already mentioned. Moonlets (objects too large to be ring particles but too small to be considered moons) are found within A, B and F rings. The A ring contains, by far, the highest number, occupying a 3,262 mile wide area. Shepherd Moons, already mentioned in connection with F Ring are also found elsewhere within the inner ring system. 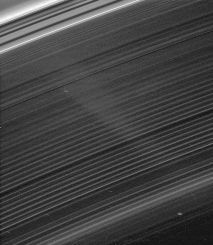 As well as Prometheus and Pandora shepherding the F Ring, we have Pan (Encke Gap), Daphnis (Keeler Gap) and Atlas (A Ring). Co-orbital Moons are objects that have almost identical orbits. Janus and Epimetheus are such a pair and have a ring named after them. 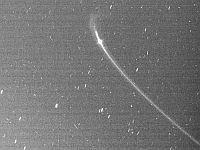 A bona fide moon, Aegaeon, has been found residing within the bright arc of G Ring. This is the collective name for three extremely small moons that orbit between Mimas and Enceladus. Methone, Anthe and Pallene are so small that they are very difficult to observe, although it is known that Methone is egg-shaped. A Trojan object is defined as something that is gravitationally connected to a much larger object, being positioned at precise points in relation to the larger object. These "Legrange Points" are very stable and can be leading (slightly in front of the large object) or trailing (slightly behind). That the planet Saturn has trojan moons makes it unique within the solar system. Tethys has two trojan moons, Telesto (leading) and Calypso (trailing). Dione is the other main moon with two trojans - Helene (leading) and Polydeuces (trailing). These are defined as generally small objects, frequently with retrograde orbits. Saturn has quite a few and they can be divided into three distinct groups. The Innuit Group consists of five small satellites, with prograde orbits, Ijiraq, Kiviuq, Paaliaq, Tarqeq and the largest, Siamaq, with an estimated size of 25 miles. The Gallic Group is four prograde moons, Bebhionn, Erriapus, Tarvos and the largest, Albiorix, with a size of 20 miles. Furthest out, there is, by far, the largest group of irregular moons. The Norse Group contains 29 satellites, all with retrograde orbits: Aegir, Bergelmir, Bestla, Farbauti, Fenrir, Fornjot, Greip, Hati, Hyrrokkin, Jarnsaxa, Kari, Loge, Mundifari, Narvi, Skathi, Skoll, Surtur, Suttungr, Thrymr, Ymir and eight more as yet unnamed. The largest member of this group, though, is Phoebe, at 133 miles in diameter. The Norse Group can also, therefore, be called the "Phoebe Group".